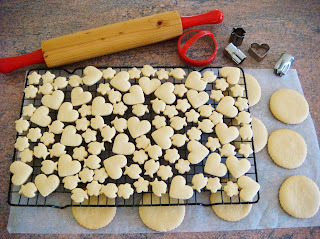 i bake for you :): Sugar, oh, honey honey..
Valentines Day and the Lunar New Year fall on the same day this year. I made honey cookies and decorated them with the spare fondant I had from last time. They're the best of both days. The red and gold for the Lunar New Year and the heart for Valentines. Melt butter. Add in sugar. Allow to cool slightly. Melt honey and golden syrup. Allow to cool slightly. Add in butter and honey. Mix. Add in egg. Combine until a dough is formed. Cover in plastic wrap and refrigerate for a few hours (so it can harder) before using cookie cutters. Roll out dough to about 0.5cm thickness. Cut using cookie cutters. Place onto a lined baking tray and bake for 6-8 minutes in a preheated 170C oven. (May take longer or shorter depending on how large/small the cookies are).